This photo was taken with my crappy camera phone. I had a grueling drive back to L.A. from San Francisco yesterday. Left at a little before 11am and got into the Grapevine area of I-5 just shortly before it was closed due to snow. 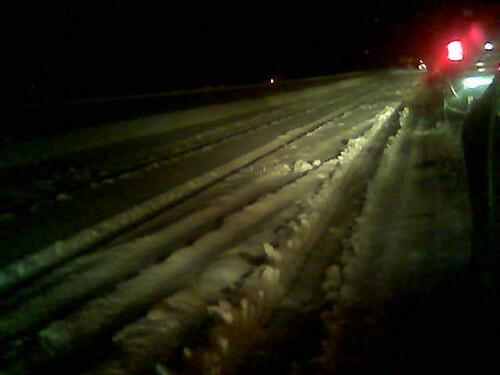 I was trapped on a snowy and icy slope alongside cars and big rig trucks for over 8 hours. The snowplows and evacuations finally made it through the 20-some miles of stopped vehicles and reached us at almost 2 o’clock in the morning. I went through a wide range of emotions while stuck there. First it was panic, which gave way to caution, and finally acceptance mixed with a whooole lot of patience.